Tiviakov wins 19th Fajr Open – and goes caving! 3/10/2011 – In another display of Iran's vibrant chess community, after the recent world records set in giant simuls, the 19th Fajr Open was held, bringing together 25 GMs, 15 IMs and 10 FMs. This event allows Iranian players a rare opportunity to seek title norms in their home country. It was won by Sergey Tiviakov. No games are available, but Sergey sent us underground photographic impressions. The 19th Fajr Open took place from 26th February – 7th March 2011 in Mashhad, Iran. There were no rest days, and two rounds played on Feb. 26 and Mar. 4, with the first game starting at 09:00 a.m., as did the single game in the final round on March 7. Amongst the participants were 25 GMs, 15 IMs and 10 FMs. Nine GMs were rated 2600+. Sergey Tiviakov, who played there very successfully and won the event, has been kind enough to provide us with many pictures of both the event and sight-seeing. Unfortunately, no games have surfaced from the event. the metro to their destination. even is a modern metro system there. One chosen spot was the tomb of Nader Shah, whose campaigns created a great empire that briefly encompassed what is now Iran, Iraq, Afghanistan, Pakistan, parts of the Caucasus region, parts of Central Asia, and Oman. After the dust had settled on the intense eleven round tournament, no fewer than eight players stood at 8.5/11 and a further eight at 8.0/11. By virtue of tiebreak, in first place was GM Sergey Tiviakov, second was GM Evgeny Gleizerov, and third was IM Davit Benidze. 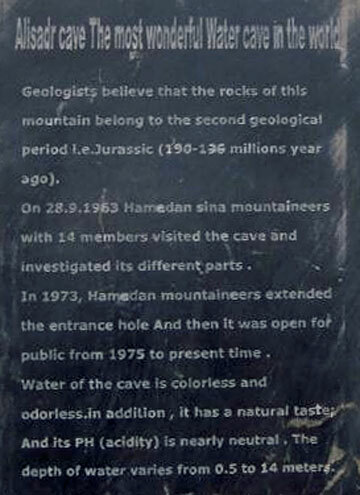 75 kilometers north of Hamadan and is the world's largest water cave. would never, never, ever, go into this cave. Sergey has not. some rare Iranian minerals. This one cost USD $300. And for USD $1000, a steal, you can buy this.